One of my favourite cook books came from my good friend Corrie. She and I have spent many a time over the years sharing good wine and food. 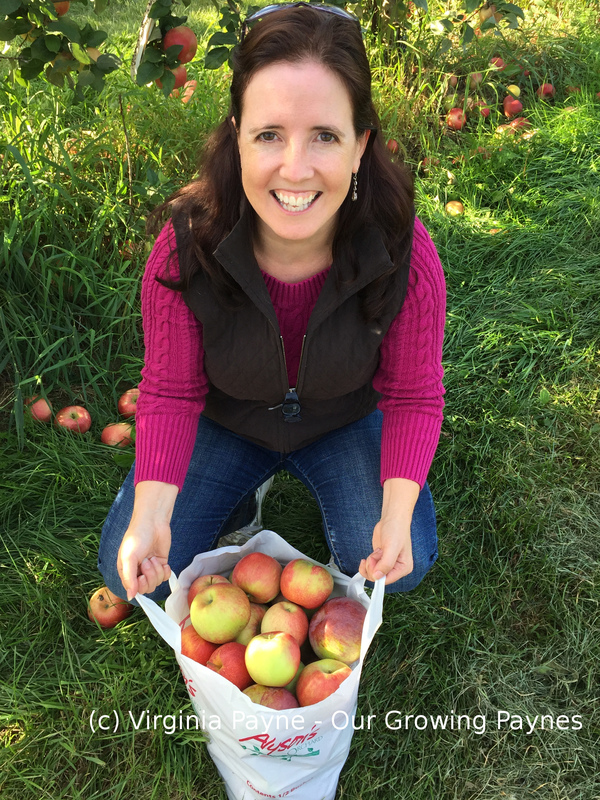 The feasts we’ve had! For our wedding she bought us the “Essentials of Classic Italian Cooking” by Marchella Hazan. There are some wonderful recipes in this book and a great one is cream and butter sauce. Also known as Alfredo sauce. I usually make this with our Homemade Pasta. 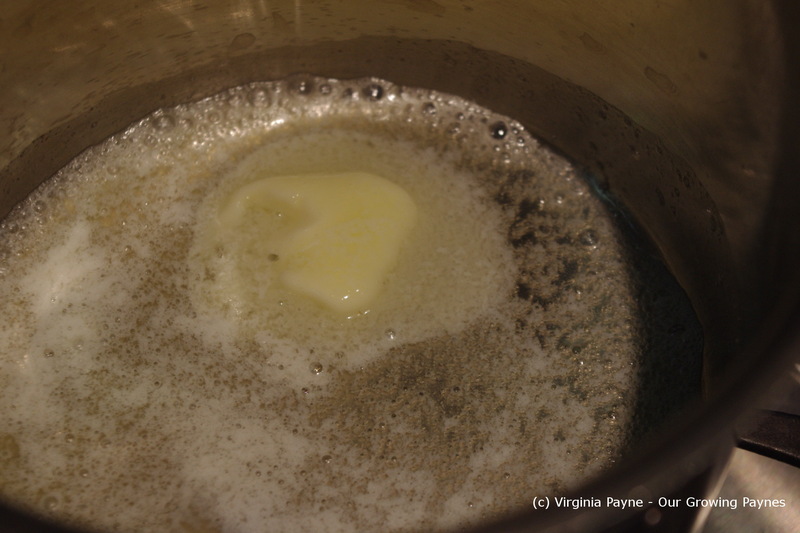 Melt the butter in a small pan and add the cream. Heat slowly and stir with a whisk frequently. Do not whisk so hard it becomes thick. This is not a thick sauce but a lovely creamy sauce that coats the pasta. While the sauce is warming up I saute mushrooms and garlic. This time we had bacon left over from the Bacon Crostini so I used a bit of that. 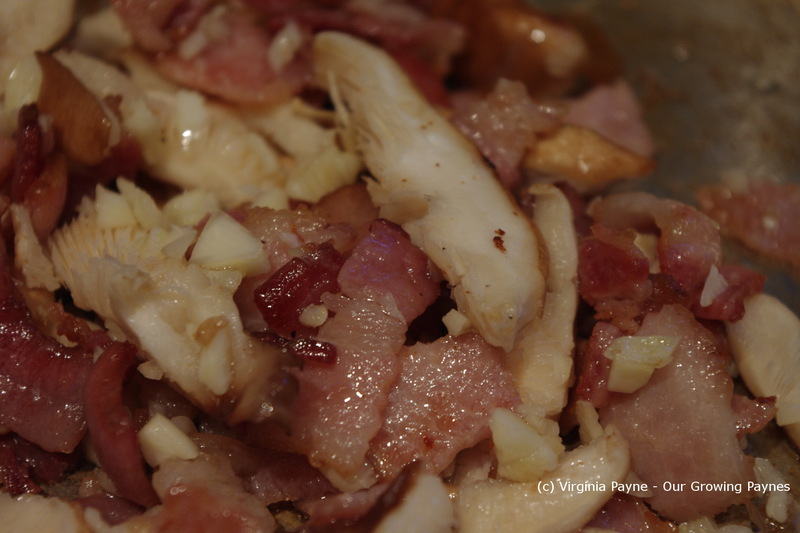 As the bacon starts to crisp up I add a bit of white balsamic vinegar to deglaze the pan. 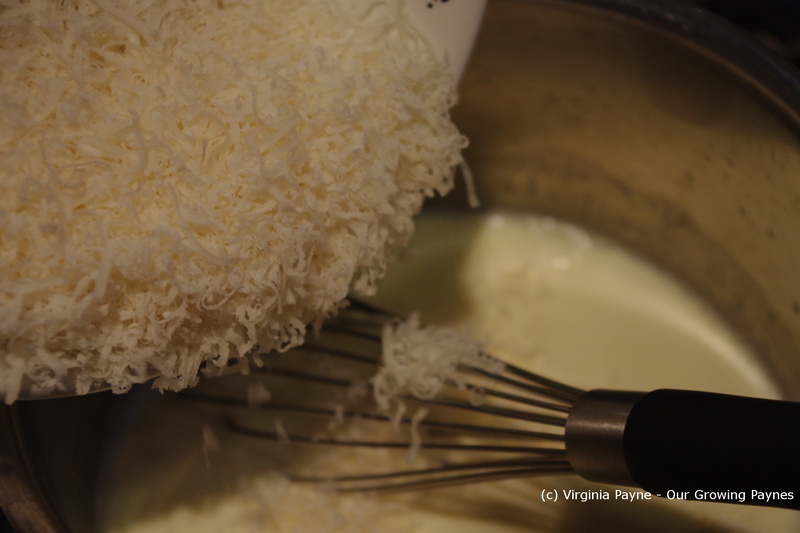 I add the cheese to the heated cream and butter and stir thoroughly as it melts. I then add the pepper and nutmeg. Adjust the seasoning as needed. At this time the pasta is cooking. Just as the pasta is done I add the sauce to the mushroom mixture and then the pasta. Toss and serve. Grate some fresh cheese and enjoy! This is an uncomplicated dish that takes less than 30 minutes to make if you aren’t making fresh pasta and the flavours are amazing. 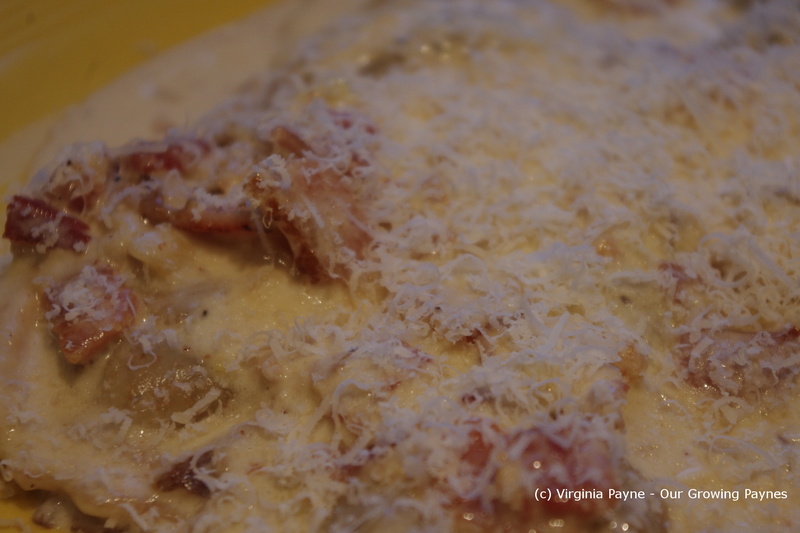 This entry was posted in Italian Recipes and tagged alfredo, bacon, butter, cheese, cooking, cream, dinner, essentials of classic italian cooking, food, garlic, mushrooms, parmesan, parmigiano-reggiano, ravioli, white balsamic vinegar. Bookmark the permalink. Wow! now that’s what I’m talkin’ about — Yummy:) thanks for sharing..
🙂 it’s such a guilty pleasure! Oops! 🙂 Everything in moderation! Bacon! You can bribe me with is! LOL that’s a good bribe! Another winner! Sounds/looks, I know tastes, incredible! Thanks! If I wasn’t worried about my hips I would eat this all the time!